But thanks to Rena Patten’s Superfoods, you won’t be struggling for inspiration anymore! 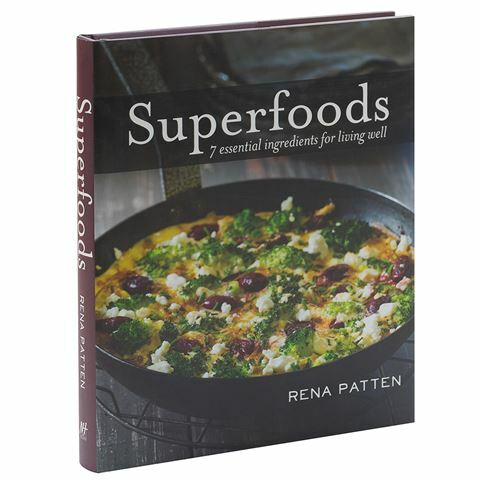 Rena has already written all about quinoa and its benefits (and become a best-selling cookbook author because of it), and now she’s tackling six other foodstuffs such as broccoli, chia, kale, raw cacao and amaranth in easy-to-make recipes that can be enjoyed any night of the week. These meals are among the best way to get your daily dose of superfoods, with plenty of recipes that cover snacks, mains, salads and even sweet desserts (woo-hoo!) Toss broccoli into a stir fry, add kale to a lasagne, scatter chia seeds over garlic and chilli chicken wings – it’s that easy. Full of recipes based around seven of the top superfoods: amaranth, broccoli, chia, kale, quinoa, raw cacao and seaweed. Each ingredient has its own dedicated chapter. Includes recipes for desserts, side dishes, salads, soups, entrees and more. Recipe index at back, and full colour photography throughout.